Is BDS’ campaign against Israel reaching a turning point? 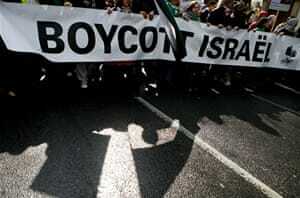 The movement calling for the boycott, divestiture and sanction of Israel is gaining momentum globally. At the height of its military – particularly nuclear – and economic power, Israel is feeling uncharacteristically vulnerable; but this time the threat is ironically coming from a nonviolent movement anchored in international law and the Universal Declaration of Human Rights. Last June, Israeli Prime Minister Benjamin Netanyahu effectively declared the Palestinian-led global Boycott, Divestment and Sanctions (BDS) movement a “strategic threat” to Israel’s regime of occupation, colonisation and apartheid by deciding to assign the overall responsibility for fighting against the BDS to the ministry of strategic affairs. This dramatic shift reflects the failure of Israel’s well-oiled “Brand Israel” campaign, run by the foreign ministry since BDS was launched in 2005, which sees culture as a propaganda tool and whose logic is to use Israeli artists and writers to show the world “Israel’s prettier face”. The realisation by many people of conscience around the world that Israel’s impunity can be brought to an end only through popular internal resistance coupled with effective, morally-consistent and sustained international pressure and accountability, has given great impetus to BDS campaigns. Israel’s brutal and illegal blockade of Gaza; its untamed construction of illegal settlements and a separation wall in the occupied West Bank; its “strategy of Judaisation” in Jerusalem, the Galilee, the Jordan Valley and the Naqab (Negev), as a ranking UN official reports; its adoption of new racist laws; and its denial of the rights of refugees, have all alienated many of its hitherto supporters. … A South Africa moment is being reached by the BDS movement. BDS’ successes in the last couple of years may be the factor that has rattled the Israeli regime. The African National Congress’ endorsement of the movement in December 2012; support for BDS and the cancellation of events by world-renowned artists and music bands; the decision by the world’s leading scientist, Stephen Hawking, to respect the boycott and cancel his participation in a Hebrew University conference; and the recent spate of boycott resolutions by US academic associations, have all contributed to the analysis that a South Africa moment is being reached by the BDS movement. But Israel’s standing in world public opinion has been eroding for quite some time now, due to two main factors: The moral power of the global BDS movement, including its crucial anti-colonialIsraeli component, and Israel’s political shift to the far right. A 2013 BBC poll shows Israel competing with North Korea as the third or fourth worst-perceived country in the world in the opinion of large majorities in Europe and elsewhere. The BDS call was launched on July 9, 2005 by an alliance of more than 170 Palestinian parties, trade unions, refugee networks, NGOs and grassroots associations calling on international civil society organisations and people of conscience to “impose broad boycotts and implement divestment initiatives against Israel similar to those applied to South Africa in the apartheid era”. Specifically, BDS calls for an end to Israel’s occupation of Palestinian and other Arab territories occupied since 1967, including dismantling the wall and colonies; an end to Israel’s system of racial discrimination against its Palestinian citizens; and the UN-sanctioned and inherent right of Palestinian refugees to return to their homes of origin. These three basic rights correspond to the three main components of the Palestinian people: those in the Gaza Strip and the West Bank, including East Jerusalem (38 percent of the Palestinian people, according to 2011 statistics), those in the 1948 territory who live under Israeli apartheid (12 percent), and those in exile (50 percent). More than two-thirds of Palestinians are refugees or internally displaced persons. Figures with the public profile and influence of Desmond Tutu, Roger Waters, Naomi Klein, Alice Walker, Judith Butler, John Berger, Ken Loach, Angela Davis, Arundhati Roy, Marcel Khalife and Aijaz Ahmed have reached the conclusion that, as in the struggle against South African apartheid, BDS is crucially needed to compel Israel to comply with its obligations under international law. By appealing to people of conscience around the world to help end Israel’s three-tiered system of oppression, the BDS movement is not asking for anything heroic, but for fulfilling a profound moral obligation to desist from complicity in oppression. Given the billions of dollars lavished on Israel annually by Western states, particularly the US and Germany, and the lucrative military trade with Israel, taxpayers in those countries are in effect subsidising Israel’s violations of international law at a time when domestic social programmes are undergoing severe cuts, unemployment is rising, and the environment is being devastated. Ending complicity in Israeli crimes is not just good for the Palestinians, it is certainly good for the “99 percent” around the world struggling for social and economic justice and against perpetual war. Building on its global ascendancy, the BDS movement – led by the largest coalition in Palestinian civil society, the BDS National Committee (BNC) – is spreading across the world, scoring significant victories. Just a few days ago, the American Studies Association adopted the academic boycott of Israel with a stunning 2:1 support ratio in its general membership. In April, the Association for Asian-American Studies became the first academic body in the US to adopt the academic boycott of Israel. Around the same time, the Federation of French-Speaking Belgian Students (FEF), representing 100,000 members, adopted the boycott of Israeli academic institutions, and so did the Teachers Union of Ireland. In March 2011, the University of Johannesburg severed links with Ben Gurion University over human rights violations. Student councils at several North American universities, including the University of California, Berkeley, adopted divestment from companies profiting from Israel’s occupation. Israel’s violent repression, ethnic cleansing and siege against the Palestinians is escalating, but the fact that the global BDS movement is winning the battle for hearts and minds across the world gives us hope that we shall overcome. Support for BDS came from major international trade union federations with millions of members in South Africa, Britain, Ireland, India, Brazil, Norway, Canada, Italy, France, Belgium, and Turkey, among others. Veolia, a corporation complicit in Israel’s occupation, has lost or had to withdraw bids for contracts worth billions of dollars, mainly in Sweden, the UK, Ireland and now the US. G4S, the largest security company in the world, is experiencing major symbolic defeats due to BDS activism in Norway, South Africa, the European Parliament, several British universities, and elsewhere as a result of its involvement in Israeli prisons, where Palestinian prisoners, including children, are tortured, and in several projects that violate international law. Admitting the damage BDS campaigns have done to its reputation, G4S is already promising to phase out its involvement in Israel’s violations of international law. The British Co-op supermarket chain, the fifth largest in the UK, has adopted a policy of boycotting companies operating in the Occupied Palestinian Territories. The United Methodist Church last year called for a boycott of products from Israel’s colonies, and so did the Presbyterian Church USA and the United Church of Canada. The Mennonite Church USA went even further by deciding not to invest in any company involved in the Israeli occupation. The Dutch government has publicly “discouraged” [Du] Dutch companies from doing business with Israeli entities in the OPT, leading the largest Dutch construction company, Royal Haskoning DHV, to withdraw from a sewage treatment project with Israeli municipality in occupied East Jerusalem. In the same context, the publicly-owned Dutch water company Vitens, has alsoterminated a contract with the Israeli national water company, Mekorot. In the same vein, the British government has issued a guidance on business involvement with illegal Israeli settlements. These steps follow the publication of EU guidelines against funding Israeli projects and entities in Palestinian territories. Deutsche Bahn, a German government-controlled rail company, pulled out of an Israeli project encroaching on occupied Palestinian land, and German foreign ministry officials informed Palestinian civil society representatives that they have advised all German academic institutions to avoid dealing with Ariel, an Israeli colony-college in the West Bank. Israel’s violent repression, ethnic cleansing and siege against the Palestinians is escalating, but the fact that the global BDS movement is winning the battle for hearts and minds across the world gives us hope that we shall overcome. We may well be reaching a tipping point. Occupied Jerusalem: Palestinian president Mahmoud Abbas has been accused of being a traitor by activists after publicly rejecting calls for a boycott of Israel. His unambiguous statement, made in the aftermath of Nelson Mandela’s death, has fuelled a bitter debate on the legitimacy and efficacy of sanctions over Israel’s treatment of Palestinians. His comments infuriated the boycott movement, which after Mandela’s death has been boosted by comparisons with the anti-apartheid campaign in South Africa and the decision last week of the American Studies Association (ASA) to boycott Israeli academic institutions. The boycott movement claims it is on a roll, citing a recent EU prohibition against giving grants or funds to bodies with links to colonies, a warning by the British government that firms risk damaging their reputations if they have dealings with Israeli enterprises across the Green Line, and the decision by a Dutch company to sever links with the Israeli water company, Mekorot. This year Stephen Hawking declined an invitation to a conference in Jerusalem. Even the British consulate in East Jerusalem, home to UK’s representative to the Palestinian Authority, operates an informal boycott policy, declining to serve colony wines, water or other produce at functions. However, the call for sanctions against Israel and/or its colonies has prompted comparisons with the boycotts of Jewish businesses by the Nazis and their supporters in the 1930s. Some opponents argue that boycotts aimed at the Jewish state can never be free of the taint of anti-Semitism. The Boycott, Divestment and Sanctions (BDS) campaign, set up in 2005 by more than 170 Palestinian civil society organisations, expects next year “to cross even higher thresholds in its drive to isolate Israel, just as South Africa was isolated under apartheid”, said Omar Barghouthi, one of its founding members. The ASA’s decision was “fresh evidence that the BDS movement may be reaching a tipping point on college campuses and among academic associations”, he added. Two other US academic bodies – the Native American and Indigenous Studies Association and the Association of American Asian Studies – have also backed the boycott movement. However, thousands of Palestinians do business with Israel, work in West Bank colonies or in Israel and buy Israeli goods. Imports to Palestine from Israel are worth $800m (Dh2.9 billion) a year. Noam Chomsky supports a colony boycott, but has said a boycott of Israel was “a gift to Israeli hardliners and their American supporters”. Many observers expect the boycott movement to gain momentum should peace negotiations between Israel and the Palestinians fail to produce a deal. Andreas Reinicke, the outgoing EU envoy to the Middle East, warned last week that momentum in favour of a settlement boycott would grow without a peace agreement. Less than two years ago, only two EU countries – Britain and Denmark – backed the labelling of goods originating in settlements as such in order to allow consumers to make informed choices. Now 14 EU states support the move. “There is movement in this direction,” he said. GAZA CITY (AFP) — A Gaza-based human rights group on Sunday expressed “deep concern” at what it called Israeli troops’ use of excessive force in Friday’s fatal shooting of a young Palestinian. The Palestinian Center for Human Rights said in a statement that soldiers shot dead Odeh Jihad Hamad, 27, and wounded his brother Raddad, 22, as they picked through scrap in wasteland next to the Gaza-Israel frontier at Beit Hanun in the north of the coastal strip. “Israeli forces used excessive force and directly opened fire at them, although it was clear that the two civilians were collecting steels and plastics from the landfill near the border fence,” the PCHR said. The Israeli military said it opened fire at Palestinians near the border in response to Palestinian violence, including the firing of a mortar round that hit southern Israel and throwing rocks at soldiers. The PCHR said troops had also used unnecessary force at a separate border incident on Friday, when they wounded three Palestinians near Jabaliya about three miles from Beit Hanoun in response to stone-throwing at soldiers. Before Friday, the last deadly incident in Gaza was on Nov. 1, when four Hamas militants were killed and five Israeli soldiers wounded during an army operation to destroy a Gaza-Israel tunnel. TULKAREM (Ma’an) — Dozens of youths in a refugee camp in the northern West Bank on Saturday demonstrated against their municipality’s decision to require residents to prepay for electricity, witnesses said. Witnesses told Ma’an that young men in Tulkarem refugee camp burnt tires for several hours in protest against the Tulkarem municipality, which is set to install prepaid electricity meters in the camp. Under the current electricity meter system, a counter tells the municipality how much electricity each family uses each month and sends a bill corresponding to the amount. Asem Musallem, a member of the camp’s services’ committee, said that due to unpaid electricity bills, the camp’s total debts to the municipality has surpassed 500,000 shekels ($140,000). He said the economic situation made it very difficult for people in the camp to pay electricity bills. But Musallem told Ma’an that the municipality had breached an official agreement with the people of the camp that was to postpone the installation of the paid counters. He said the protests in the camp were not against the prepaid counters themselves, but against the decision not to postpone their installation. Tulkarem Mayor Iyad al-Jalad told Ma’an he was unaware of any agreement to postpone the installation of the prepaid meters. Nevertheless, al-Jalad said there was a meeting scheduled for Sunday evening with the people of the camp to discuss the protests and the installation of the counters. There are 19 refugee camps in the occupied West Bank, within which live about a quarter of the 771,000 registered refugees in the territory. More than 760,000 Palestinians — estimated today to number 4.8 million with their descendants — were pushed into exile or driven out of their homes in the conflict surrounding Israel’s creation in 1948. Palestinian political prisoner and resistance icon Samer Issawi is scheduled to be released to his home in Jerusalem on Monday after more than 17 months in Israeli detention. 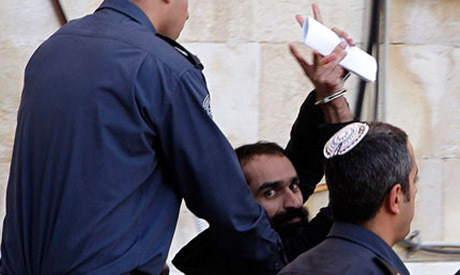 Issawi ended his 277-day long hunger strike on 23, April 2013 after accepting a deal brokered by Israeli and Palestinian officials to serve eight months on charges of violating bail conditions for an earlier release. In October 2011, Issawi, then serving the ninth year of a 30-year jail sentence for involvement in resistance activities against Israel, was released as part of an Egypt-brokered prisoner swap between Hamas and Israeli authorities. That deal led to the release of captured Israeli soldier Gilad Shalit in exchange for more than 1,000 Palestinian prisoners in Israeli jails. However, Issawi was rearrested July 2012 under Israel’s so-called administrative detention law. The law, which has been in place since the end of the British mandate in Palestine in 1948, allows for the arrest of Palestinians if they are deemed a “threat” to Israel’s national security. Palestinian hunger strikes have posed a new challenge to the Israeli government, which has come under international criticism for its practice of detaining prisoners without trial. A Free Samer Issawi Campaign was launched on 18, January 2013. Independent activist and campaign coordinator Abbas Hamideh said that the campaign spread like “wildfire,” achieving a huge following within days. The campaign now has almost 11,000 followers. “The reason we started this campaign was to bring Samer’s plight to the world due to the mainstream media’s silence on the matter. Samer was literally dying behind Israeli occupation jails and there was no time to waste and we needed a plan to get the word out and what better way than to utilise the social media network combined with activities on the ground,” Hamideh told Ahram Online. According to a report issued November by the Palestinian prisoner support and human rights association Addameer, at least 4,996 political prisoners are currently in Israeli prisons. At last an Egyptian politician who makes sense which shows that the situation is not as desperate as we thought despite the occupation of Egypt on behalf of foreign affiliated NGOs who manipulate society in its different layers . Hosted by the radio of the Resistance – al Nour- Mister Ahmed Khawli head of al Istiqlal Party which was part of the Labour Party confirmed the fact that Egypt witnessed a military coup at the hands of chief Commander al Sisi and the Military Council. This – according to Mister Khawly- brought Egypt back to Mubarak’s days and brought Egypt under something similar to Mubarak’s rule and now fifteen ministers in the actual government belong to the previous rule . Al Sisi is the previous chief of Intelligence Services under Mubarak’s rule and part of Mubarak’s ruling team and part of the Military Council as well .And, for this reason, the sons of Mubarak were acquitted and Ahmad Shafiq released, not overlooking the fact that the two sons were originally tried-along with their father the president- for insipid crimes that do not constitute a real case for a corrupt rule that has lasted almost forty years . The military has taken over – said Khawly- and 19 Districts among the 26 Districts that form Egypt are ruled by militaries. The Egyptian army has stopped being a National Army since Sadat’s days and this is when the army -in the form of the Military Council and high officers- turned corrupt. The reason is that Sadat wanted to divert the Egyptian Army from its sworn enemy Israel and –for this reason has provided it with material privileges which were denied to the regular soldiers but offered to the high officers.. Thus, 50% of Egypt’s economy is in the hands of the Army who owns huge companies and employs the soldiers to do service in these companies . Now the goal is no more to fight Israel but to fight what they call Terrorism . On top of this-added Khawly- the army is sharing in besieging Gaza and has closed all the tunnels with the district accusing Hamas of things Hamas did not commit .Not only this but al Sisi is responsible for burning entire villages in Sinai after coordinating with the Israelis . This image of al Sisi is not being promoted by the media , what the media offers is something else- concluded Khawly- and all what is being said about Egypt drifting away from the US to get closer to Russia are mere stories . Egypt’s rule is totally in tune with the US and Egypt cannot get its weapons from Russia.. The communications between Egypt and US have never been severed and the army is still getting aid from the Pentagon even if the shipping of some heavy weapons is being suspended for the time being. This is because since Sadat , Egypt has joined the US/Israeli alliance and become part of it and has prevented thus any weapons from reaching Gaza. As for what happened in Sinai, the situation is complicated and many factors are playing there . Mubarak has always tried to please the Bedwins which is why he allowed the smuggling of goods through the tunnels that was profitable to the tribes. But now there is land seizing and, instead of distributing the land to the Bedwins to help them become sedentary, big pieces of land were allotted to big companies to build their cartels something which the Bedwins resented . The chaotic situation in Sinai is due, on one hand to the Israelis whose agents are active on the ground , and – on the other- to the armed thugs that work for Mohammad Dahlan and are on his payroll. The murder of the Egyptian soldiers at Rafah -during Ramadan -happened at the hands of agents who came and left on Israeli vehicles and after crossing the borders they were shot at by a missile that burned them to dust . Regarding the new constitution around which a referendum will take place soon , Khawli said that 60% of Egyptians will boycott the referendum and this because the present constitution has erased the article that speaks about corruption as well as the article that protects Prophets and Religious Symbols from being slandered . The constitution has also stripped Egypt of its religious and Arab identity and allowed civilians to be tried by military courts as well as it gave the minister of defense large prerogatives whereby he is appointed by the Military Council and cannot be removed by anyone – not even by the Council itself – and would have to remain in post for eight years before being replaced . All this does not say anything good . Three prominent Egyptian activists from the 2011 uprising that led to the fall of Hosni Mubarak have been sentenced to three years in jail. Ahmed Maher, Ahmed Douma and Mohamed Adel were found guilty of organising a recent unauthorised protest. They were arrested after protesting in November over a new controversial law that restricts demonstrations. The move will deepen concern in Egypt about a growing crackdown on dissent, says the BBC’s Orla Guerin in Cairo. The three well-known activists have long called for greater democracy in Egypt. Egypt’s military-backed authorities could hardly have chosen more high-profile democracy campaigners for prosecution. Ahmed Maher, Ahmed Douma and Mohammed Adel were at the forefront of the 2011 revolution. Mr Maher, founder of the 6 April Youth Movement, was a Nobel Peace Prize nominee in 2011. 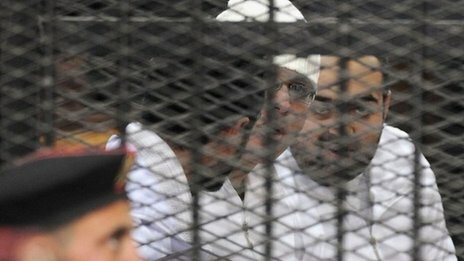 Mr Douma, who has been jailed several times, is regularly seen leading chants at demonstrations. The jailing of three leading secular activists will deepen concerns – in Egypt and the West – about a growing crackdown here. Islamists were the initial focus; several thousand have been detained. But it is clear the net has spread to include liberals. Dozens of have been rounded up for breaching the controversial protest law under which the three were convicted. Human Rights Watch described their trial as “classic authoritarianism” and said it was part of a pattern of prosecutions. Mr Maher and Mr Adel were founding members of the 6 April Youth Movement, which led protests to remove long-time President Hosni Mubarak in 2011. The three were among a group of demonstrators outside the upper house of parliament in late November protesting over the new law, which states that public gatherings of more than 10 people must be authorised. The military-installed government has defended the law, saying it is not intended to limit the right to demonstrate but rather to “protect the rights of protesters”. But its opponents say the law has in effect replaced a recently expired state of emergency, and is stricter than the measures in place during the rule of Hosni Mubarak. The men are the first to be jailed under the new law. The court in Cairo found them guilty of holding a demonstration without authorisation and attacking police officers. State-run television said the men had been sentenced to three years’ hard labour. They have also been ordered to pay a $7,000 (£4,000) fine each. As the verdict was read out, the courtroom erupted with chants of “Down, down with military rule! We are in a state, not in a military camp”, Reuters news agency reports. Until recently, the main targets for arrests by the authorities had been Islamists, many of whom continue to protest over the ousting by the military of the Muslim Brotherhood-backed government of Mohammed Morsi in the summer after weeks of mass protests. But recently dozens of liberal activists have been rounded up, our correspondent says. The government maintains it is on the path to democracy, but that is not how it looks to many Egyptians, she adds. This citizen journalism image provided by Aleppo Media Center, AMC, which has been authenticated based on its contents and other AP reporting, Syrian citizens stand on rubble of houses that were destroyed due to Syrian forces airstrikes in Aleppo, Syria, Wednesday, Dec. 18, 2013. Syrian government aircraft dumped barrels packed with explosives on at least four opposition-held neighborhoods of Aleppo on Wednesday, the fourth day of stepped-up airstrikes on the contested northern city, activists said. 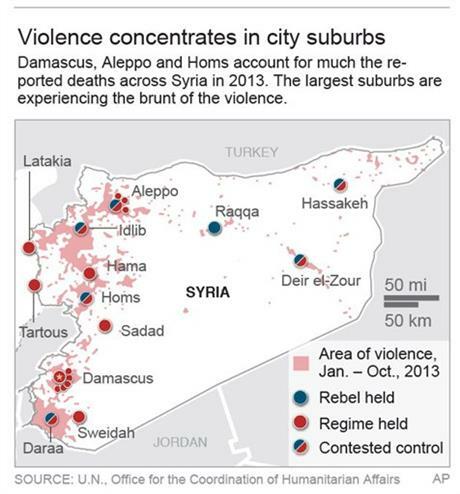 Map summarizes the violence across Syria for 2013. BEIRUT (AP) — Syrian aircraft pummeled an opposition neighborhood in the northern city of Aleppo on Sunday, killing at least 25 people and extending the government’s furious aerial bombardment of the rebel-held half of the divided city to an eighth consecutive day. Since it began on Dec. 15, the government’s unusually heavy air campaign in Aleppo has killed more than 200 people, smashed residential buildings and overwhelmed the city’s hospitals with casualties. The timing of the assault — a month ahead of planned peace talks in Switzerland — suggests that Syrian President Bashar Assad could be trying to strengthen his position and expose the opposition’s weaknesses before sitting down at the negotiating table. Sunday’s air raids targeted Aleppo’s Masaken Hanano neighborhood, hitting a second-hand market, a two-story building and a main road, activists said. The Britain-based Syrian Observatory for Human Rights said at least 25 people were killed. Observatory director Rami Abdurrahman said the death toll could rise because 17 of the wounded were in critical condition. Another activist group, the Aleppo Media Center, put the death toll at 32, and published a list of the names of the dead on its Facebook page. “The medics say they are removing people in parts; they aren’t sure how many there are,” said Hassoun Abu Faisal, an activist with the Aleppo Media Center. He said the bombs destroyed vehicles lining a main road, destroyed a two-story building and left a crater where part of the market was. Activists said the airstrikes were carried out by government helicopters that dropped so-called barrel bombs, crude devices filled with explosives and fuel that are wildly inaccurate but cause massive damage on impact. Human rights groups warn that even if Syrian forces are targeting rebels with the bombs, they often explode in residential areas, killing civilians. In an amateur video posted online, a man held up to the camera a severed foot from the air raids, while crowds scrambled among rubble, hoarsely shouting “God is Great!” as they came across corpses. Flames and dust from the smashed building and cars darkened the sky. One man rhythmically smashed a hammer against a jammed door of a vehicle containing charred bodies. The videos appeared genuine and corresponded with other Associated Press reporting of the events depicted. In the town of Marea outside Aleppo, a barrel bomb that exploded near a school used by Syrian fleeing fighting in other areas killed three members of the same family, according to Abu Faisal and the Observatory. Syrian officials have not commented on the air raids in Aleppo, the country’s largest city, and a major front in the war since the rebels launched an offensive there in mid-2012. The city has been carved into opposition- and government-held areas. Syria’s civil war, now into its third year, has killed more than 120,000 people, according to activists. Millions have fled their homes because of the fighting. In central Syria, a suicide bomber blew himself up near a primary school in the predominantly Shiite town of Umm al-Amed in Homs province, killing at least 12 people, half of them children, the Observatory said. 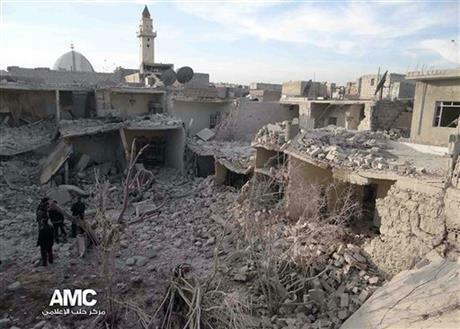 Syrian state media said eight people were killed, and said 34 were wounded, mostly children. It wasn’t immediately possible to reconcile the conflicting tolls. The bombing underscores how Syria’s civil war, now in its third year, has become more sectarian. Syria’s rebels are mainly Sunni, with hard-line brigades emerging as the most powerful fighting groups. Shiites and other Syrian minority groups have either stayed neutral or sided with President Bashar Assad, fearing for their future should the rebels prevail. Groups on both sides have targeted civilians. Also Sunday, Syrian military aircraft bombed Bab al-Hawa, a border crossing to Turkey, said a private Turkish news agency, Dogan, and the Aleppo Media Center and the Local Coordinating Committees, two activist networks. The news agency said the bombs hit the Syrian side of the crossing, killing or wounding several people, and that several ambulances from the Turkish town of Reyhanli were heading to the border gate to carry the wounded to hospitals. It was not immediately clear why the area was targeted. Iraq’s al-Tagheer TV cited Iraqi Parliament sources saying supervision over Iraqi airports have been under the watch of Hadi al-Ameri, Maliki’s minister of transportation, and the Iranian regime’s support to the Assad regime through Iraq is nothing new to anyone. These parliamentary source protested Iraq becoming the strategic grounds for the Iranian regime to carry out its plans and agendas in the region. They added the Parliament cannot impose its supervisory role on Iraqi airports due to Nouri Maliki’s control over the security dossier. British national daily newspaper the Guardian website reported on Friday that Mandela apparently underwent weapons training by Mossad agents in Ethiopia in 1962 without the Israeli secret service knowing his true identity. They attributed their report to “an intriguing secret letter lodged in the Israeli state archives”. The site reported that the missive, revealed by the Israeli paper Haaretz – two weeks after Madiba’s death – that he was instructed in the use of weapons and sabotage techniques and was encouraged to develop Zionist sympathies. The foundation has however denied that such a thing occurred. “In 1962 Mandela received military training from Algerian freedom fighters in Morocco and from the Ethiopian Riot Battalion at Kolfe outside Addis Ababa, before returning to South Africa in July 1962.